Fire crews are tackling a massive fire at a recycling plant. 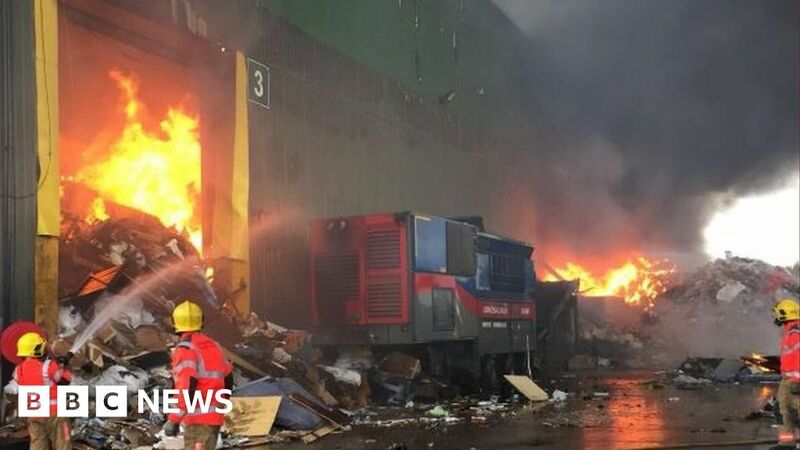 Greater Manchester Fire and Rescue Service (GMFRS) said the blaze at JWS Waste in Frederick Road, Salford, started some time before 17:30 BST. Fifty firefighters and six fire engines are at the scene. GMFRS advised residents living nearby to close windows and doors due to the amount of smoke in the area. It also asked people to avoid the area as there are a number of road closures in place. ️ Aerial footage from the scene at a large recycling plant in Frederick Road, Salford shows the extent of the fire that our crews are currently tackling. Parts of Broad Street, Frederick Road, Lower Broughton Road, Cromwell Road and Lissadel Street are closed, GMFRS said. Stephen Coen, councillor for Irwell Riverside, tweeted that the fire was “burning aggressively”. The same plant was ravaged by a large fire in 2015.